Dining takes center stage on Celebrity Solstice, with an impressive array of free and for-fee dining options. Of the 10 restaurants, six are open for breakfast, seven for lunch (though its main restaurant is only open at midday on sea days) and eight for dinner. From the ever-changing, tempting array of dishes at the main dining room to tasty, healthy fare at AquaSpa Cafe and the silver-service, flambe and sense of theater at French-inspired Murano, dining on this ship is a delight. If you want to experience the latter, reserve a table online or on embarkation day as this exceptional culinary experience is deservedly popular. Grand Epernay (Decks 3 and 4): The towering, airy Grand Epernay is the ship's main dining room, spanning two decks at the aft end of the ship. The room is bright, and light in tones with ample use of the ship's signature design element, glass. In fact, instead of a wine cellar, one end of the dining room is accented with a two-story glass wine tower, replete with tall ladders to reach bottles at the highest levels. Surprisingly for a ship with 2,800-plus passengers, this restaurant feels spacious and uncrowded. There is ample room to navigate between tables, and the room's openness, combined with extensive carpeting on the floors, results in a tolerable noise level, even when the restaurant is busy. Breakfast, lunch (sea days only) and dinner is served at Grand Epernay, with a wait of no more than five minutes for a table, even at peak times. Dinner is served in two conventional sittings (typically 6 and 8:30 p.m.) with assigned tables and tablemates. Lunch and breakfast are open seating. The Celebrity Select flex-dining option is also available from 5:30 to 9 p.m. With Celebrity Select, passengers have the option to decide whether they want to eat with their own party or at a mixed table with other people. They can also make specific dinner reservations for each day of their cruise online in advance, make reservations onboard or simply show up when they are ready to eat. Service is prompt, attentive, helpful and friendly and the food is consistently good. The breakfast menu offers similar dishes to those available at the buffet-style Oceanview Cafe, such as eggs Benedict, fresh fruit and pancakes, but the dining experience is more upmarket thanks to the elegant surrounds. It's a particularly lovely option on sea days when there is time to relax over breakfast instead of rushing off to an excursion. Lunch consists of lighter, cafe fare such as burgers and fish and chips plus hearty dishes such as beef short ribs, with crowd-pleasing desserts such as New York cheesecake, decadent chocolate cake or a selection of ice cream and sorbet. The dinner menu is divided into two sections: "always available" favorites such as Caesar salad, salmon, New York strip steak and creme brulee, which are available every night and a daily changing menu where the likes of rack of lamb and seafood fettuccini sit comfortably alongside more adventurous dishes like frog legs. If you are unsure what to order, ask the waiters as their suggestions are usually spot on. Vegetarian and healthier options are identified on the menu, but if you have specific dietary needs (vegan or gluten-free), discuss them with the maitre d' before your first meal, or ask specific questions about the menu items you select. Requests are handled with aplomb according to several diners we spoke to who required special meals. With an appealing mix of French, Italian and "New American" styles featuring contemporary ingredients and cooking styles, you are sure to find something to tempt you on the menu. Luminae (Deck 3): Only cruisers staying in suite accommodations can dine at Luminae, an intimate restaurant that is open for breakfast, lunch (sea days only) and dinner. The space is elegant yet contemporary with decor that ties in with the onboard "sun" theme. Large picture windows lend an appealing shimmer to the restaurant's gold and chrome design accents, and two separate rooms create a refined atmosphere. Dishes are several steps above the main dining room visually, with a focus on modern, stylish plating, but not quite equal to what is on offer in the ship's excellent specialty restaurants. Service is superb and Luminae never feels busy, even when it is full. Breakfast includes staples such as omelettes and pancakes along with a few surprises like huevos rancheros, a tasty Mexican breakfast dish and a creamy yogurt granola parfait. Espresso style coffee is complimentary but not comparable to what is on offer at the for-fee coffee lounge on Deck 5. Lunch is served from noon until 1:30 p.m. on sea days and includes a choice of appetizers, sandwiches and entrees and a couple of desserts. Dinner includes a changing daily menu plus the option to order from the main dining room menu. Meals begin with an amuse-bouche compliments of the chef followed by appetizers including roasted squab, beef tartar and lobster salad with hearts of palm. Mains consist of pappardelle with venison ragout, ricotta cavatelli with duck Bolognese and Thai green vegetable curry. Serving sizes are sensible to allow room for desserts such as mascarpone cheesecake with pistachio nougatine and rich dark chocolate mousse. While the food is delicious, it is the excellent service and feeling of exclusivity that lifts Luminae to new heights. With a team of attentive wait staff and an attractive dining room that offers a feast for the eyes as well as the stomach, Luminae delivers on its promise of a "deliciously exclusive dining experience." Luminae is open is open from 8 to 9.30 a.m. for breakfast, noon to 1.30 p.m. for lunch and 5.45 to 9:30 p.m. for dinner. Blu (Deck 5): Passengers who have booked AquaClass cabins can eat at Blu, a private restaurant serving lighter "spa-inspired" fare, which relies less on rich sauces and sauteing and more on natural reductions, ragouts and herbs. Breakfast includes a variety of healthy starters such as a low-fat yogurt parfait with blueberry compote or bowl of crunchy muesli. Hot dishes range from berry pecan pancakes and French toast to a smoked salmon and asparagus frittata. Blu features a similar dinner menu to Grand Epernay with a choice of three appetizers, four soups and salads, a salad entree, four main entrees and three classic grilled meat dishes. While some meals are similar to those served in the main dining room, the plating tends to be more refined and service is more personal. Tables for two are very close together and therefore best suited to couples who enjoy socialising more than romantic tete-a-tetes. AquaClass passengers do not have to pay extra to dine here and suite passengers may book tables on a space-available basis, for free. The restaurant is off limits to all other passengers. It is open for breakfast from 8 to 9.30 a.m. and dinner from 5:30 to 9 p.m.
Oceanview Cafe (Deck 14): Oceanview Cafe is a multi-station buffet for breakfast and lunch, and an open-seating casual alternative venue for dinner. One of the most appealing buffet venues we've seen at sea, the Oceanview's layout is excellent, with many serving and prep stations situated as islands in the middle of the room rather than stretched along the walls. The result is a dependably uncrowded, spacious operation offering an extensive number of choices. There are conventional choices such as British (bangers, English bacon, baked beans) and Asian (miso soup with mix-ins, tofu, rice, etc.) stations, as well as vegetarian options, an epic salad bar, freshly tossed pasta dishes with carved meat stations rounding out the mix. While the main area of Oceanview Cafe does close for (very) short periods throughout the day so staff can set up the next meal service, you are unlikely to go hungry. Pizza, pasta and ice cream are available from noon to 1 a.m., and breakfast is served until 11 a.m. Coffee, tea and juices are available 24/7 from self-serve dispensers. The standard breakfast selections don't change (omelette station, Canadian and American bacon, turkey and pork sausage, potatoes, fruit, pastries and breads) but there is more than enough variety to satisfy even the most demanding diner. Lunch features one changing "Chef's Choice" station (primarily a carving station for ham, leg of lamb, beef, etc.) in addition to taco, pasta, stir-fry, sandwich, soup, salad and other specialty options that change from day to day. Sandwich choices include hot (corned beef) or cold (turkey, chicken salad) with a selection of breads, condiments and sides such as fries. Live cooking stations featuring customized pasta choices with a selection of sauces (Bolognese, marinara, Alfredo) and made-to-order stir-fries featuring meat, seafood, spices and sliced vegetables are also on offer. The salad bar is available daily and offers a tremendous array of choices. Drink service is speedy and tables are generously spaced, which -- combined with floor-to-ceiling windows -- give a relaxed, open feel to this popular dining area. Oceanview Cafe is open 6:30 to 10 a.m. for breakfast (10 to 11 a.m. for late breakfast), noon to 2:30 p.m. for lunch, 3:30 to 4:30 p.m. for afternoon tea and 6 to 9:30 p.m. for dinner. Mast Grill (Deck 14): The Mast Grill, located on the same deck as Oceanview Cafe, but forward of the main swimming pool, serves burgers, hot dogs, fries and the like. It's open from 11:30 a.m. to 5 p.m.
AquaSpa Cafe (Deck 15): The AquaSpa Cafe, located in the Solarium, provides healthy and convenient breakfast options -- such as granola and fruit - and salads and made-to-order dishes like grilled salmon for lunch. The cafe also serves complimentary tea, coffee and juices. Open 7.30 a.m. to 9 a.m. for breakfast and noon to 2 p.m. for lunch. Room Service: Room service is available 24 hours a day with a choice of sandwiches, pizza, salads and desserts. Room service is complimentary unless you order one of the few for-fee premium options such as an artisanal French cheese platter ($15). Full or continental breakfast is also available. Suites and Concierge Class cabins have a more extensive breakfast menu to choose from, with delicious premium options such as freshly squeezed juices and creamy smoothies included at no extra charge. Room service is complimentary for all passengers, except when ordered between 11 p.m. and 6 a.m., when there is a $4.95 per room service fee. Suite guests are entitled to complimentary room service 24 hours a day. Whether you fancy a bowl of noodles or elegant haute cuisine, there is something to satisfy your taste buds at one of Celebrity Solstice's many specialty dining venues. Enjoying a meal at one of the half-dozen for-fee restaurants is a real treat with innovative cuisine, well-spaced tables and attentive service. It is well worth allowing a little extra in your vacation budget for at least one specialty dining experience. Deck 5 is the epicenter for specialty dining on Celebrity Solstice. The Ensemble Vestibule -- an edgy, black, box-like room with an innovative audio-visual art installation -- is the entryway into the Ensemble Lounge, an energetic, convivial watering hole ideal for pre-dinner drinks. 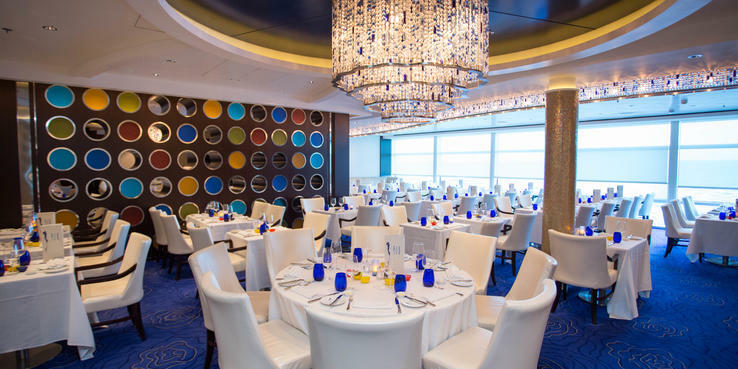 In one of the best pieces of interior architecture we've seen on any ship, Ensemble forms a nexus from which four specialty restaurants -- Blu, Murano, Silk Harvest and Tuscan Grille -- fan out like spokes of a wheel. Keep an eye out for discounts on embarkation day when specialties tend to be quiet; otherwise bookings are essential for most venues. Murano, in particular, tends to fill up very early during each cruise. Dinner is served from 6 p.m. to 10 p.m. at each venue. Speciality restaurants open for lunch occasionally on sea days, depending on the itinerary. Murano (Deck 5); $50: Food at Murano is rich and decadent, with traditional French dishes such as foie gras, creamy bisques and a cheese course sitting alongside contemporary interpretations of classic meals. The centerpiece is a six-course tasting menu, featuring appetizer, soup and salad, fish course, palate cleanser (sorbet), meat course and dessert; all of the dishes except the sorbet are also available on an a la carte menu. There are two choices for each course on the tasting menu, and the option of a wine paired with each. Wine pairing raises the charge to $89 rather than the standard $50, however pours are generous. Consummate service and dishes such as cognac flambeed lobster tail with basil, smoked bacon and Dijon-cream add a hint of theater to this exceptional dining experience. Silk Harvest (Deck 5); $35: Silk Harvest is pan-Asian, with a menu offering a melange of related, but not necessarily complementary, dishes. Dine on Japanese favorites such as sushi, beef and chicken sate, green chicken curry or Chinese-style roasted duck, all served family style in the center of the table. While some passengers may find it difficult to justify the $35 cover charge for fairly pedestrian Asian cuisine, Silk Harvest offers a pleasant change of scene for those on longer cruises. Tuscan Grille (Deck 5); $45: A prime aft location ensures this stylish yet charmingly rustic restaurant is a popular choice, especially when the ship is at sea or anchored in picturesque South Pacific ports. Steaks are the star at Tuscan Grill, though pasta-lovers have plenty of options, too, including ravioli, lasagne, spaghetti Bolognese and lobster linguine Alfredo. It is best to dine early so you can enjoy the view before the sun goes down. Cafe al Bacio (Deck 5); a la carte: Coffee lovers can get their caffeine fix at Cafe al Bacio & Gelateria, which also offers gelato and Italian ices at an adjoining stand, all for a la carte pricing. Cakes and other goodies in the refrigerated cabinet change throughout the day and are free. With its comfy seats, elegant decor and some of the best coffee on the high seas, patrons must be prepared to pounce on empty seats at this popular cafe, particularly during peak times. Open daily from 6:30 to 12.30 a.m.
Sushi on 5 (Deck 5); a la carte: Passengers can choose from a variety of rolls, sashimi and other entrees, all priced per item, at this cheery Japanese cafe-style venue. Selections include a bowl of edamame to snack on ($4), lobster ramen ($12), spicy tuna roll ($10) and chicken ginger gyoza ($7). Open noon to 2.30 p.m. and 6 p.m. to 10 p.m.